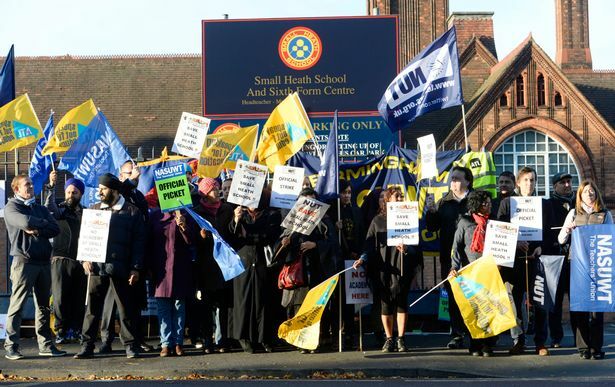 NUT, NASUWT and ATL members at Small Heath School, Birmingham are taking their 4th day of strike action on November 18th (with another planned on 10th December) against plans to turn the school into an academy. The IEB show no sign of being prepared to negotiate. They have refused talks with local and regional union officials and ACAS. There is no evidence that academy conversion improves schools. Indeed, sponsored academies have the worst record on school improvement of any type of school. The strike comes at a time when the government are seeking to outlaw opposition to academy conversion via draconian restrictions in the Education and Adoption Bill. A group of the strikers from the school will also be lobbying MPs at Westminster on the day at the NUT Lobby. This entry was posted in News, Top story and tagged Birmingham, Forced academisation, NUT. Bookmark the permalink.